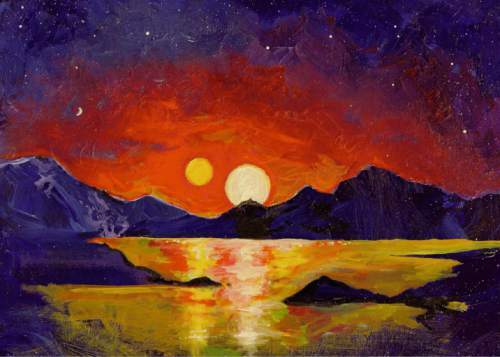 Courtesy | Ben Bromley, University of Utah In this acrylic painting, University of Utah astrophysicist Ben Bromley envisions the view of a double sunset from an uninhabited Earthlike planet orbiting a pair of binary stars. In a new study, Bromley and Scott Kenyon of the Smithsonian Astrophysical Observatory performed mathematical analysis and simulations showing that it is possible for a rocky planet to form around binary stars, like Luke Skywalkerís home planet Tatooine in the ìStar Warsî films. So far, NASAís Kepler space telescope has found only gas-giant planets like Saturn or Neptune orbiting binary stars. Luke Skywalker would likely feel at home on a number of real-life planets. Giant, rocky masses orbiting two suns have a place outside of Hollywood, according to a pair of researchers from the University of Utah. The study hasn&apos;t been published yet, but an early version, called "Planet Formation Around Binary Stars: Tatooine made easy," is available online. "Tatooine sunsets may be common after all," the study from U. astrophysicists and the Smithsonian Astrophysical Observatory states. It suggests planets "are as prevalent around binaries as around single stars," like Earth&apos;s own sun. Previously, the only planets believed to circle such binary stars were giant gassy versions with no capacity for life. The research team used mathematical formulas to determine how difficult it would be for a planet to travel around such stars. The study did not identify any planets with binary suns, but simply determined they are possible. "The ride around a pair of stars can be just as smooth as around one" when a planet is first forming, said co-author Ben Bromley, in a prepared statement. The same "recipe" that supposedly worked around the meeting place of Obi Wan Kenobi and Han Solo could work around the sun, Bromley said. NASA&apos;s Outer Planets Program paid for the study, which was a continuation of research into Pluto.